I usually try very hard to think up my own headlines when passing on items like this, but sometimes you just have to concede that the one you found can’t be improved upon. So, enter the newest candidate for the ultimate in environmentally-friendly building materials – fungal mycelium [via MetaFilter; image by James Jordan]. Mycelium doesn’t taste very good, but once it’s dried, it has some remarkable properties. It’s nontoxic, fireproof and mold- and water-resistant, and it traps more heat than fiberglass insulation. It’s also stronger, pound for pound, than concrete. In December, Ross completed what is believed to be the first structure made entirely of mushroom. (Sorry, the homes in the fictional Smurf village don’t count.) The 500 bricks he grew at Far West Fungi were so sturdy that he destroyed many a metal file and saw blade in shaping the ‘shrooms into an archway 6 ft. (1.8 m) high and 6 ft. wide. Ecovative’s next product, Greensulate, will begin targeting the home-insulation market sometime next year. And according to Bayer’s engineering tests, densely packed mycelium is strong enough to be used in place of wooden beams. It kinda makes sense — fungus cell walls are made of chitin, which is pretty tough stuff. Oxymoron of the day: Mold-resistant fungi! this is awesome…what a trip….very hopeful and cool… does it burn? can it be grown in shape a la shaped bamboos? either way it sounds very cool. Smaller, more compact, solar oriented, well insulated dwellings will cut capital and running costs for the smaller bodied of the Great Hulking American Neanderthals; spawn of two hundred years of corporate force feeding and breeding for exploitation of Americas resources, now gone! Mushrooms as building material make as much sense as Hemp, another fast to grow, easy to replace material! The huge supply of wood being burned in Detroit Cities ruination has yet to re-grow and the Great hulking American Neanderthal must turn to other building materials – the fine West Coast firs are all gone! Redwoods? same story! The Asian, remaining small in stature and modest in diet of veggies and rice, smaller dwelling spaces, compact economical cars, electric bullet train networks, has a lower operating cost and will surpass the Great Hulking American Neanderthals this way, even with mushroom and hep houses, complete with bamboo and solar heat, with even super insulation, but this is one way to cut costs and keep our heads up for a short while. this is awesome! you could just grow it to shape, whatever you needed. i’d love to grow a house. This fits so well… while conventional wood construction is bedeviled by mold and fungus problems, here we let the fungus take us by the mycelium and we get strong, safe structures from trash! I have a growing barn where I would like to produce this synergistic stuff. I believe two frequency geodomes would be a good canidate for such a remarkable building material. Truly grow homes, possibly at such a low cost that young people can truly invision living in a 3000+ sqaure ft home for exceptionaly low cost. More money for education. I read about this great product, but except for the insulation qualities, I doubt the construction industry will welcome such a strong, indestructable material. As a packing material it can eliminate much of the styrafoam being used. I think it would be a great addition to home foundations if not the entire structure. 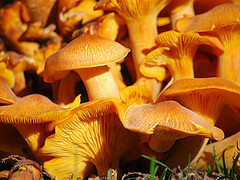 Read ‘Mycelium Running: How Mushrooms Can Help Save The World’ by Paul Stamets. It has a whole lot of other uses for mycelium! I haven’t read it yet but I bought it as a gift to my father and he absolutely swears by it! Further we may well have developed blue eyes by similar means from our evidently greater-minded relatives. I detest being unable to build constructions to a relative, adapted size easily out of purposefully textured structure. You southern-landers can go and have your micro car and I don’t want one any larger then optimal, yet your sizes are a persistent pain for my body. –As for this material, should I be able to make it into a mold for a house (and ohh, how this new language we use is awful–“make a mold for a fungi house, oh, no wait don’t take it like that”)or a dome-house, for a set of connected dome structures, or of domes and assemblable structures should be a saving grace for housing for my, and indeed all people, should we get our act together enough to dig the structure, lay out a mold, find the spores, and use our freaking corn-shells! -emphasis meant.